Released today at InterSolar Europe, Letting in the Light: How Solar Photovoltaics Will Revolutionise the Electricity System finds the solar industry is poised for massive expansion, driven primarily by cost reductions. It estimates that solar PV capacity could reach between 1,760 and 2,500GW by 2030, up from 227GW today. Capacity: Solar PV is the most widely owned electricity source in the world in terms of number of installations, and its uptake is accelerating. It accounted for 20% of all new power generation capacity in 2015. In the last five years, global installed capacity has grown from 40GW to 227GW. By comparison, the entire generation capacity of Africa is 175GW. Investment: Solar PV now represents more than half of all investment in the renewable energy sector. In 2015, global investment reached USD 67bn for rooftop solar PV, USD 92bn for utility-scale systems, and USD 267m for off-grid applications. Jobs: The solar PV value chain today employs 2.8m people in manufacturing, installation and maintenance, the largest number of any renewable energy. Environment: Solar PV generation has already reduced carbon dioxide (CO2) emissions by up to 300m tonnes per year. This can increase to up to three gigatonnes of CO2 per year in 2030. Reaching a 13% share of global electricity by 2030 will require average annual capacity additions to more than double for the next 14 years. The report highlights five recommendations that can help achieve this increase including: updated policies based on the latest innovations; government support of continued research and development activities; creation of a global standards framework; market structure changes; and the adoption of enabling technologies like smart grids and storage. 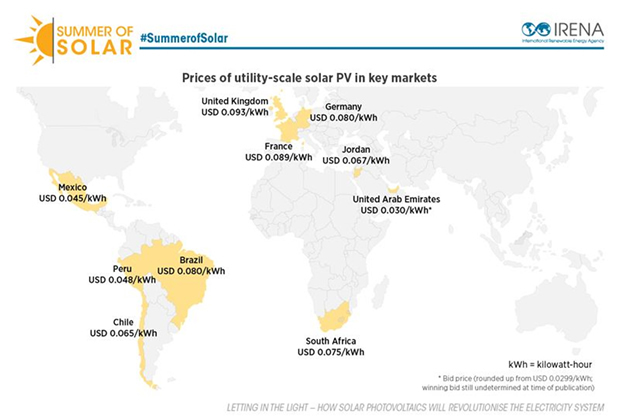 Letting in the Light is the third solar-focused publication released by IRENA this summer. Last week, IRENA released The Power to Change, which predicts that average costs for electricity generated by solar and wind technologies could decrease by between 26 and 59% by 2025. Earlier this week, IRENA released End-of-Life Management: Solar Photovoltaic, which found that the technical potential of materials recovered from retired solar PV panels could exceed USD 15bn by 2050, presenting a compelling business opportunity.